(MP032). Alma Claude Burlton Cull (1880-1931). Watercolour, signed and dated 1926..
Standard size: 14 x 10ins (36 x 26cms) approx. There have been British Royal Yachts since the time of King Charles II and probably before; but it was not until 1842 that the first steam Royal Yacht was ordered. She was laid down in Pembroke in Wales, named VICTORIA & ALBERT and was commissioned by Captain Lord Adolphus Fitz Clarence Royal Navy on 1 July 1843. 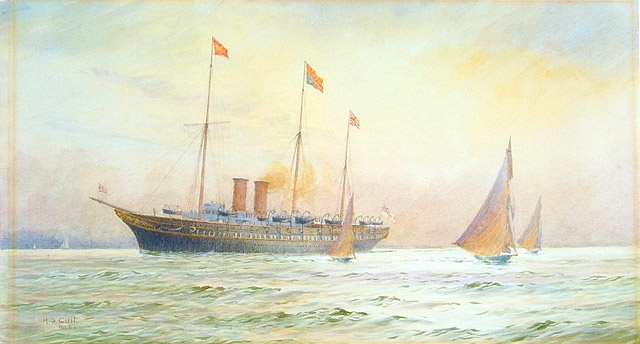 A second VICTORIA & ALBERT followed in 1855 and towards the end of Queen Victoria’s reign and the end of the century when imperial competition between Russia, Great Britain and Germany was reaching fever pitch, Sir William White, Director of Naval Construction, was instructed to design a third VICTORIA & ALBERT who was to be the last word in imperial yachts. She made more than 60 overseas voyages to Europe and the Mediterranean in her time and was a regular visitor at Cowes Week. She is seen here in 1926 wearing the Royal Standard of His Majesty King George V. In Command of HM Yachts’ (for so the title then was) was Rear Admiral Sir Henry Buller KCVO CB, a former commanding officer of the battleship HMS MALAYA. The Yacht’s distinctive profile with those huge Court Flags floating from her three impossibly tall masts was a familiar sight at the fleet reviews and other nautical pageants held during the inter-war period, and those who served in her  as those who subsequently served in BRITANNIA - invariably cherished their time on board. Laid up at Royal Yacht Moorings in Portsmouth during World War II, painted battleship grey and used as an accommodation ship, V&A - as she was universally known - never went to sea again. Having been stripped of her numerous historical and sentimental fittings  many of which were transferred to her successor, BRITANNIA, together with a good many Royal Yachtsmen - V&A left Portsmouth on 1st December 1954 under tow for Faslane in Scotland where the melancholy business of breaking her up began. This painting, together with another by Frank Wood (see below), escaped the bombing of Cull's studio safely aboard V&A at the top end of Portsmouth harbour and was eventually transferred from her to BRITANNIA’s wardroom where it hung for the 44 years of the latter’s sea-going life. It is still to be seen there by visitors to the Yacht at her new home in Leith, Scotland and has been made available for this Limited Edition print by the kindness of the trustees of the BRITANNIA Trust. The paintings of Cull that did survive are eagerly sought after and the Maritime Museum at Greenwich is where the majority are to be found: some are in private collections and from these the occasional oil or watercolour of Cull’s pops up at auction to be deftly snapped up. Cull was especially skilled at painting delicate cloud formations and the sparkling translucency of light on wavetops.